Honing Powder | Abatron, Inc. Unique blend of abrasive compounds effectively smooths rough, worn marble and terrazzo floors, vanities, tabletops, countertops, and walls. Eliminates heavy traffic patterns, surface scratched, heavy etches, abrasions, and deep glass rings. Removes crystallized coatings and overspray. Can be used by hand or machine. Powder formula. Use with water. Commercial use only. Q What number grit is the powder? When used with a buffer will it remove most surface stains? FYI: Looking for a product to use on terrazzo floor that has heavy traffic stains and some discoloration from mastic. I experimented with basic sand paper and pumice stone and had some encouraging results. Unfortunately, we are unsure of the powder's grit. It is a heavy dense powder. 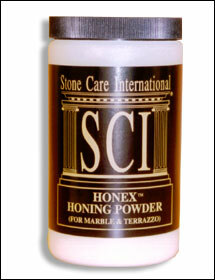 Honing Powder will smooth heavily worn marble and terrazzo surfaces and smooth out heavy floor traffic patterns, surface scratching, etching, abrasions, and deep glass rings.